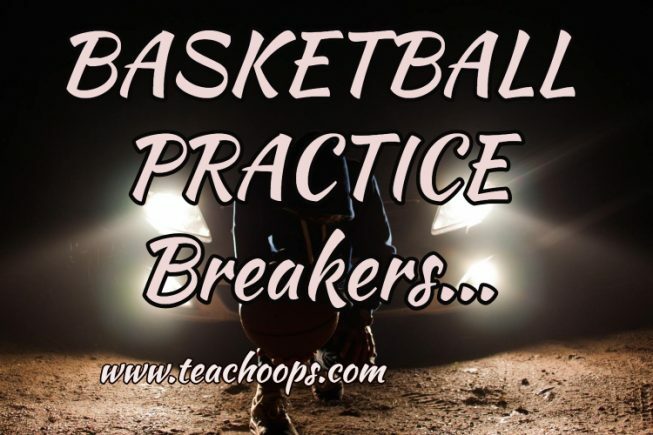 “Practice Breakers” are fun and challenging 10 minute activities that help break up the tedious practice schedule. Every player will have their name listed on “The Practice Breakers Board”. They each get 1 Point for every “Practice Breaker” activity they win, including tiebreakers if necessary. At the end of the year, whichever player has the most points gets a symbolic reward or prize from the coaching staff. What usually works best is an item or symbol that best represents the spirit of “Practice Breakers”, which is all about working hard as a team everyday, but having fun and staying loose as well. 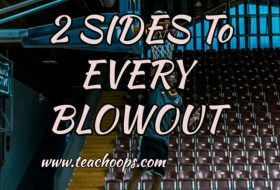 1) “Opposites”: A 10 minute scrimmage where every player can only use their opposite hand to dribble, pass, and shoot. Their strong hand can only be used to catch passes, and as a guide for shooting and dribbling transfers. Coaches ref the scrimmage to make sure everybody’s sticking to the rules. Every player on the winning team gets 1 point for “The Practice Breakers Board”. This activity is hilariously fun, but also strongly encourages each player to work intensely on developing their opposite hand. 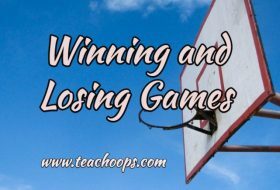 It gets them in the habit of forcing the issue, and experiencing the intial ups and downs along with the rest of the team. “Opposites” is a tremendous team confidence builder, and is truely a blast. Have fun! 2) “Half-court Heroes”: 3 players spread across the halfcourt stripe. They will all back up several feet, and with a running start at the coach’s whistle, will each take a halfcourt shot at the same time. The challenge is for them to choose the proper height, distance, and speed that will allow their shot to arrive at a different time then their 2 teammates. Thus giving their shot a better opportunity to go in. 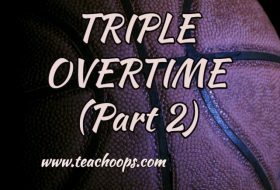 The only true rule is that all 3 players must shoot at the same time. Coaches ref this activity as well, and often join in with the team, which makes it even more fun. The player with the most makes at the end of 10 minutes, gets a point on “The Practice Breakers Board”. Your team will love it! 3) “Stick and Pick”: The coaches select a specific shot for every player to shoot. 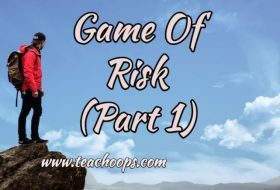 Whoever makes(sticks) it first, gets to pick the next shot for everybody to take until the next make, which can be any shot they want, regardless of the difficulty. The more difficult each shot becomes, the safer it becomes for the current leader to protect their point for “The Practice Breakers Board”. There are only 2 simple rules. First, the shot must be attempted from no more than a few feet beyond the 3 point line, and must be shot from in bounds. Second, the line must rotate in order every practice, so each player gets the chance to be the first shooter. It’s very similar to “H.O.R.S.E.”, but is so much more challenging and engaging. The last player to make a shot at the end of 10 minutes, will of course, get a point on “The Practice Breakers Board”. This is also another great opportunity for coaches to participate whenever they see fit. Enjoy!